New Sequoia Park Zoo friend! 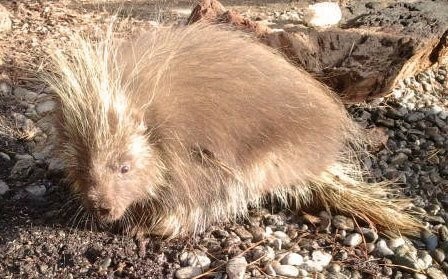 Meet the Sequoia Park Zoo's newest kid magnet Dorsie the porcupine! I know what you cynics are thinking: "Ho hum, I swerve to miss hitting those things with my car all the time. Get me a freakin' rhino already!" But this is when Dorsie's inspiring personal story sucker punches you in the cute receptor. You see, someone did hit her with their car. But the Humboldt Wildlife Care Center stepped in and nursed her back to health. Sure, she has some noticeable mobility issues, but zookeepers are hopeful that her condition will continue to improve. When you take your kids to see Dorsie -- 'cuz you will -- be sure to sound smart by noting that her name is derived from the North American porcupine's scientific name Erethizon dorsatum. Learning! Above: Dorsie occupying the old otter enclosure.